The V.A.T. exercises in this course will go a long way to improve the size and shape of your arms and you’ll learn the secrets of how to accentuate parts of the muscles to give the illusion of a better shape. The arms are one of the most impressive and important body parts for a bodybuilder. The possession of massive arms has dominated the interest of bodybuilders all over the world ever since man first invented the barbell. A pair of exceptionally developed, well-shaped arms not only sets off the whole physique but conveys the impression of great power and strength. 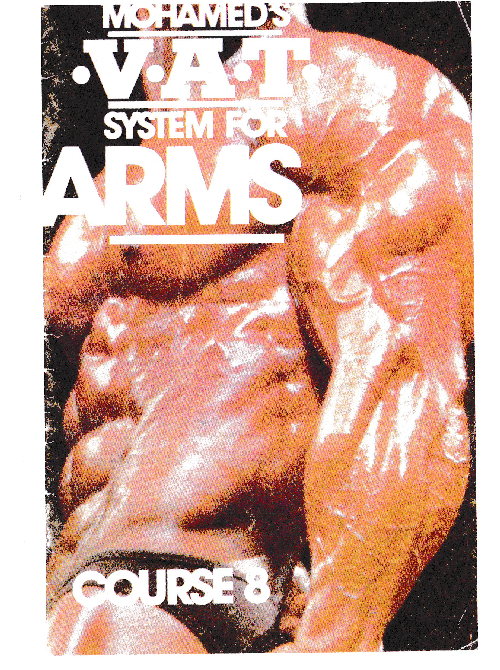 The arms are easily the favourite body part to train for nearly all bodybuilders. Since the arms are usually exposed, they are easy and convenient to show off. Even the average person on the street is impressed with well-developed arms and to him the arms are the symbol of strength. Most people recognize a bodybuilder by his arms and if you are a bodybuilder, you are expected to have good arms, the bigger the better. And the bigger your arms are, the more respect and attention you get. Of course, everyone knows that when someone asks you to “make a muscle” they expect you to flex your arm and show your biceps. Even though I try to train all my body parts equally hard, I too always seem to have that little extra enthusiasm when it comes to training arms. While in the “old days” it was thought one had perfect symmetry if your calves, upper arms and neck all measured the same, today it is permissible to be slightly “top heavy”. That is, I feel your arms (along with your delts) should be as big and developed as you can get them, even if it means your upper arms are an inch or so bigger than calves and neck. Because although theoretically winning titles is based upon a total body look and each body part should be equally developed, in actuality, the possession of big arms is so captivating and arresting that the people with the “big guns” always seems to get more attention from the judges and fans at contests. Nearly every top bodybuilder past or present has fantastic arm development from Bill Pearl, Reg Park and Leroy Colbert in the late 1950’s and early 1960’s to Larry Scott, Dave Draper and Rick Wayne in the mid and late 1960’s to Arnold Schwarzenegger, Sergio Oliva, Kal Szkalak, Boyer Coe, Albert Beckles, Robbie Robinson and Bertil Fox to name but a few in the present. Some may be known for great abs, legs or chests, but we seem to remember best the guys with the big arms.